Bred by World renowned Clematis breeder, Raymond Evison. They have a much reduced height at 1.5m or so, and a much higher flower count, which last much longer. Unlike any other Clematis, these beautiful, free-flowering, patio beauties are perfect for any size of garden! 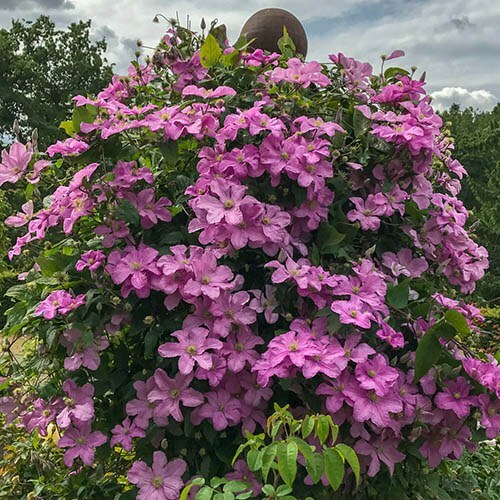 These incredible compact climbers are much shorter than other Clematis and flower bigger, better and for much longer, producing their outstandingly pretty blooms across the whole summer - six whole months of flowers, from May to October! Ideal for growing up a small frame, wigwam or trellis, they are the perfect size for a patio pot – come summer they’ll be simply smothered in their gorgeous star-shaped blooms. Bred and grown by the world-renowned Raymond Evison at his state of the art “Guernsey Clematis Nursery”. He has bred these varieties specifically to flower for longer, and be really easy to manage! Raymond has spent over 40 years breeding some of the world’s best Clematis, and has won Gold Medals at the most prestigious flower shows all around the world – including Golds at Chelsea for the last 10 years running! These plants are perfect for any garden. They are vigorous and healthy like all Clematis, yet bred to be compact and easy to manage – growing only to about 1.2m (4ft) – so they are ideal for beginners, or people with smaller spaces. Supplied as a 5L potted plant on a cane tripod.